I purchased the '92 Stealth on October 12th, 1998 from Prestige MotorSports. Previous owner, Alan Lin, financed most of the mods before I purchased the vehicle including major investments on suspension, brakes, powertrain, and interior upgrades. He even financed a new paint job (car was originally red). What seemed like a decent deal at first quickly went sour. After one week of owning the car, a rear bank turbo seal failed allowing a stream of oil into the exhaust. You wouldn't believe how much blue/white smoke one car can produce. The same day, I found out that I had a leaky intake valve in #3 cylinder while performing a compression and leak-down test. So I removed the turbos & heads to get them rebuilt. I've also had the pleasure of performing a clutch swap. Other items requiring attention included a non-functioning horn, misaligned body panels, dent removal, missing bolts / stripped threads, non-functioning gauges, and removal of old non-functioning mods. Not to fault Alan Lin for the problems, Prestige MotorSports did not know how to take care of it while they had it for several months. A friend witnessed them run it hard and promptly shut it down. It was also taken home overnight and over weekends for joy riding and I watched them play with the VPC during a test drive as if it were a radio equalizer explaining that it didn't work. I also believe that many of the mechanics that worked on the car cut corners. Beyond fixing and maintaining, I've added a Willians 6pt harness to both seats and BOZZ Speed hood bonnets. I've also detailed the engine bay by sand blasting the plenum, repainting the intercooler pipes, and other small details. I failed the front bank turbo October 31st, 1999 and have been without boost since. 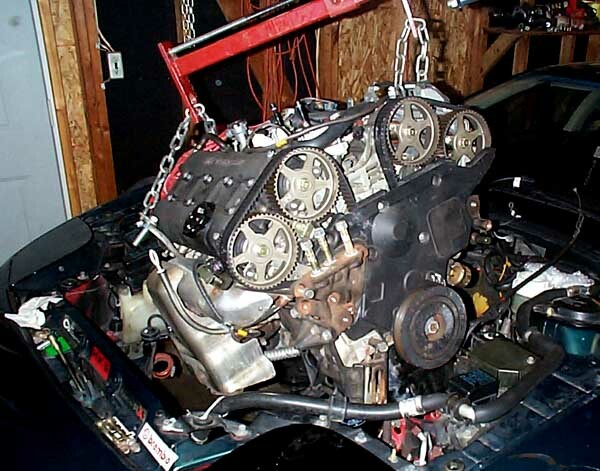 In March of 2000 I decided to put together a new engine when I submitted the winning bid on E-bay for a brand new 4 bolt block (steel crank and all). One thing led to another and I spent way more than I ever imagined. When finished, it should scoot pretty good. There will be a couple items I have yet to see tried, we'll see how it works out. I will race the car both 1/4 mile and open road. Here are some of the highlights of the new powertrain. After breaking in the engine with the above mods, I'm considering a FMIC with new piping, an ignition upgrade, shorter runner upper plenum with more volume, and perhaps a new cam grind with adjustable cam gears. Out with the old 2 bolt. Anyone need a perfectly good two bolt short block with 50,000 miles? - lets talk . . .
And eventually in with the new . . . many, many pictures to follow . . . I've got some work to do. BTW, pulling the engine with transaxle still attached through the top with a cherry-picker worked quite well.